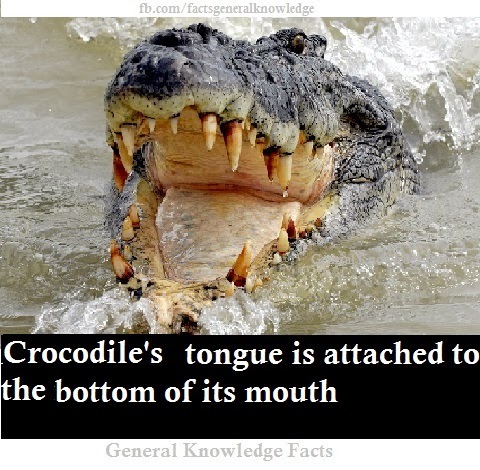 amazing fact animal facts animals crocodile crocodile facts general knowledge facts tongue facts. A crocodile's tongue is attached to the bottom of its mouth. A crocodile is not able to stick out its tongue because it is attached to the bottom of its mouth by a membrane that limits its movement.The tongue of the crocodile is typically bright yellow or orange.The tongue has salt glands which produces saline fluid.Crocodile's tongue consist of chemo receptors which detect chemicals in water.Crocodiles have a pore opening in the surface of tongue , a trait that separates itself from an alligator. Labels: amazing fact, animal facts, animals, crocodile, crocodile facts, general knowledge facts, tongue facts. Your site is giving very good information, It is very useful to us. You can also find in this site also.